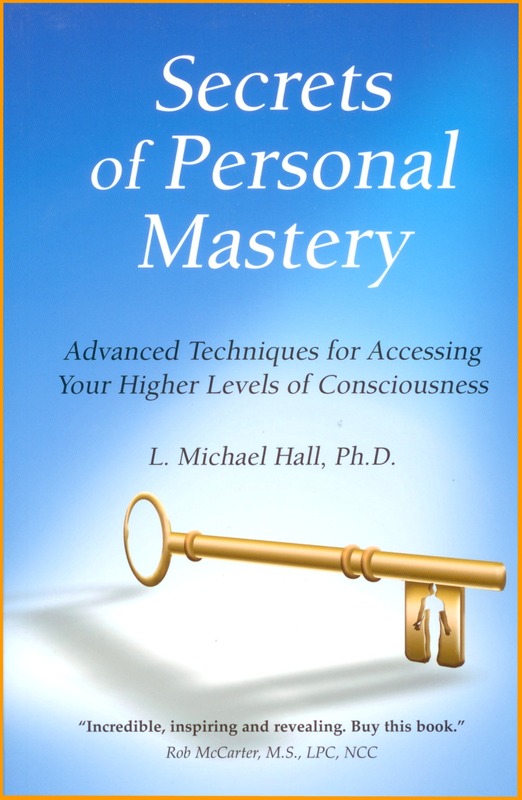 Secrets of Personal Mastery (2000, Crown House Publishers, Paperback, 224 pages) by L. Michael Hall, Ph.D. enables you to access your executive levels and taking charge of your mental-emotional programming. In this way you can develop the higher frames of mind that will enable you to control your states, take effective action, access your personal genius, and be at your best. Secrets treats mind as an emergent process of our entire mind-body-emotion system. This leads to one of the secrets: it’s not what we think that controls our destiny and experiences, but how we think—our frames of mind. Ch. 5 Your Executive "Self"
Incorporating executive decisions into action via rehearsal, habituation, clarity of understanding, feedback, etc. Julie didn’t think she had any personal power. And from what I could see from the way she lived her life and her everyday feelings, I wouldn’t have connected her with the idea of "personal mastery" either. I soon discovered that she didn’t even know about her executive powers. "What do you think, Julie, do you want to live out of your own values and visions and let them guide you as your executive powers?" "Yes, I do" she said in a soft voice. "Really? I don’t think so," provoking her a bit, "I think you ought to be a mirror for the values and visions of others and that you should spend your energy on living up to what others prescribe for you!" "You do...? No, I don’t want to do that. I’ve spent too much of my life already living that way and I’m tired of it." "You have chosen up until now to live your life to please others, to conform to their values and visions about life?" "Yes, I have. That’s really the story of my life." "And what do you say at this point in your life, does that express your uniqueness and specialness? Is that what Julie is about?" "So it sounds like you’re clear that in order to more fully experience and express your own personal power, you will need to push out the opinions of others so that you can give yourself a chance to actualize your own dreams and passions." "Right. But I don’t know how to do that." "Really? You sound definite about what you don’t want to tolerate any more. Or, were you just pulling my leg?" "No, I wasn’t kidding, I really am tired of trying to please others." ‘Well, isn’t that the starting point for you then? That is, to push away and refuse to tolerate being a slave to the values and visions of others, then you’ll be able to identify your own." "I guess so. Is that how it happens?" "Then have you accessed your executive power to establish that as your pathway? ... Would you like to?" "My executive power? I don’t understand." "You don’t know about the higher levels of your mind, those executive levels where you set intentions and purposes, where you establish your passions about who to be and what to experience?" "No, it’s not that at all. It’s the higher levels of your mind, the part of your mind where you establish your life direction and then build processes for activating that vision in your way of being in the world." "That sounds nice... but ..
"Julie, suppose ... just for the sake of this discussion that you woke up tomorrow totally free from being dominated by the opinions of others and totally free to choose your own way. Just imagine that ... go ahead, be wild in your imaginations about this ... Good. What would that be like?" "What would that be like?" "Yes. Suppose you woke up with all of your executive powers of mind and emotion so that like any empowered, informed, and decisive CEO, you awoke ready and able to live in a way that’s fully congruent with your values. ... How would you know that you’re truly free from the opinions of others and that you get to choose to live by your own values?" "Well, I would be breathing easier ... and I’d be focused on what I want to do .. and I’d just act on my goals to make them come true." "I’d be feeling confident enough about myself to call on some people in my field and setting up some contacts." "How would that be different?" "I’d not be worry about what others would be saying. I’d be focused on what I can do and taking one step at a time to make it happen... Oh, I’d not be overwhelming myself by expecting my goals tomorrow. "Any difference in how you’d be presenting yourself?" "I’d be speaking with more confidence, more firmly, you know, with a sense of strength in my voice." "With the tone of voice that you’re now using? Julie, perhaps you have awaken that executive within. Perhaps the journey has begun.. What do you think?" and the mind-muscle connection that enables us to translate "concepts" into everyday actions. This book has been designed to facilitate your personal adventure in discovering and using the secrets that govern your executive power so that you can cultivate the personal mastery over your mind and emotions that you desire. Upon making that discovery, you will enter into the higher management, the management of your own mind at all of its levels. And that will enrich you for the ultimate development of excellence—accessing your personal genius. And from there? Well the sky is the limit. You can apply your executive powers to your career and business, to mastering your health and fitness, your relationships, or wherever you’d like to apply that mastery. Regarding this kind of a thing, many books, programs, and trainings promise that the pathway to wealth, health, success, and mastery will be "quick and simple." You will find no such promise here. Personal mastery does not come easily, quickly, or even naturally. If the secrets for accessing your executive power and developing personal mastery came easy and quick, would we not see more people at that level? No, the truth is that mastery necessitates effort. We have to give ourselves to it. Do Olympic athletes reach the Olympics without effort? Do they obtained medals easily and without training? No, there’s a price for mastery. At the same time working toward mastery can feel like an exciting journey. It does not demand a nose-to-the-grind kind of self-denial. The Flow researcher, psychologist Csikszentmihalyi, has documented that the majority of those who do reach optimal levels of human excellence do not find it "work." Instead, as they become so absorbed in their passion, they get lost in it. What may appear to an outsider as "work" or "struggle" is experienced by the master as part of the fun, part of the challenge. The mental mastery involved in "running your own brain" involves a discipline of understanding and skill. As in any other field where people master a set of competencies—to access your highest executive states involves learning the principles (secrets) and applying or practicing the operational dynamics. And as with other disciplines, those who enter into process more often than not become so fascinated and caught up by the challenge of discovery, that they primarily experience it as fun and exciting. The flow of their optimal experience transforms the very quality of their adventure as a discipleship. The content of this field focuses on mind, consciousness, subjective experience—hence, "personal" mastery. This also includes both physical and mental mastery. If you choose to accept the pathway to your own mastery by means of identifying, accessing, and utilizing executive states, you will adventure "inside" to explore the very structures that now organize and govern the very basis of your life. This exploration will take us on a search for the dynamics of mind at all of its higher levels, the dynamics at those levels which set the frame for how we think, feel, speak, and behave. Knowing this, in turn, gives you an insider’s knowledge about how to run your own brain and body, and how to take charge of your own experiences. It offers to transform you into the World’s Best Expert for bringing the best out of yourself. Mastering the Higher Levels of Your Mind aims to facilitate your own personal discovery of specific secrets— secrets about executive power. This will enable you to become a competent explorer as you discover and take charge of your own inner executive states. The secrets create a whole new level of empowerment. It puts into your hands the mechanisms by which you can effectively leverage control over your mind, emotions, body, experiences, and destiny. To do that, we will first provide a model of mind. It does help to have a good workable model of mind if you want to manage it, especially its higher levels. But a caveat. The way you will come to think about mind will differ from how you have typically learned to think about it. Here you will offer a brand new way to think about your thinking and feeling, your beliefs and values, and your memories and imaginations. Traditionally, psychology has treated mind too much as a thing and its contents as its most important features. You will not find those assumptions accepted here. Instead we treat mind as an emergent process of our entire mind-emotion-body system and structure as more determinative than content. In the chapters to come you will discover that it is not so much what you’re thinking that controls your destiny and experiences, but how your thinking—your frames of references. This theoretical model of mind (the Meta-States Model) is briefly sketched here. Also, we will provide coaching via a set of exercises and technologies. Why? To give you practical experience in "running your own brain." So along the way you will find various Thought Experiments and processes (exercises, experiments, patterns) for making accessing your executive powers. When you come upon these Thought Experiments, Stop ... in your mind, put the book down and immediately run the experiment (the ellipses of three dots ... provide a signal to do this). What scientist wouldn’t put his or her theories to the test by using their lab equipment to see if the hypothesis can stand the crucial test of an experiment? So refuse to allow yourself to buy into the ideas of this work without trying the processes out for yourself. We know they work. We have lots of testimonials to their effectiveness. Yet the best way for you to know that lies in your own experiences of the processes. Is it possible to think and work through Thought Experiments and thereby experience significant transformations? Yes, you bet it is! How? This can happen because all thoughts are not on the same level. We not only experience "thoughts," we experience all kinds and qualities of thoughts. The "thoughts" we experience on a day to day basis comes in a wide range of assorted forms that we call beliefs, values, understandings, knowledge, intuitions, decisions, ideas, etc. These "thoughts" can take the form of images, pictures, movies, diagrams (visual representations), sounds, music, noise, beats (auditory representations), body sensations, movements, touch, intuitions (kinesthetic representations) smells (olfactory representations), tastes (gustatory representations), balance, orientation in space, movement (vestibular representations), words, language, mathematics, music, metaphor, story, narrative (symbolic and linguistic representations) etc. Our "thoughts" can also become very rich and intense by involving many kinds of representations simultaneously. We can also jump levels and think "thoughts" about our "thoughts" (meta-cognition). When we do, we layer one level of thinking upon another level. This creates the levels of our higher frames of mind—our executive states and it reflects our executive power. This highlights one of the secrets. All of our thinking-and-emoting (which creates states and frames of mind) do not work on the same level. We begin with the regular thoughts that make up our primary states of mind and emotion. Then we move to higher level frames of mind that involve more complexity as we layer thought upon thought. With each feedback loop, we build up Conceptual States. With these executive levels of mind, we build attitudes that we then carry with us through life. Yet often these higher level thoughts of our attitudes do not serve us very well. They may be toxic thoughts and states. They may poison our very existence. What conceptual states do you have and "never leave home without?" What attitudes do you seem to take everywhere you go? Do you tend to think optimistically? Do you tend to see the dark side of things? Do you expect people to be warm and friendly? Or do you expect people to be out for their own gain at your expense? When we move to such high level states of mind, we access a "place" or "attitude" that has more influence, more power, and more extensiveness than just a regular, everyday frame of mind. These states-upon-states, or meta-states, of layered thoughts-and-emotions then govern experience. We experience these meta-level structures or executive states, as more complex and stable. As a result, working with, communicating with, and relating to these states will require higher level understandings. Would you like to get to your boss? What about the boss in others? As you discover how to effectively speak and relate to our own (or another’s) executive states of mind-and-emotion—you discover how to go right to "the boss." This will provide immediate access to the processes that actually govern our experiences. With this access, we can now go right to the boss who runs the show over our emotions, behaviors, reference systems, and our model of the world. Wouldn’t you find that kind of executive power be valuable? Communicating: being able to quick recognize the level of thought and to tune into that level. Mind: recognizing our own levels and the levels of mind-and-emotion in others. Understanding: being able to more thoroughly understand ourselves and others. Relating: being more able to support, validate, and assist others. Persuading: by recognizing the governing influences at the higher levels. Skills: by learning how to use the executive level technologies as guidelines for effectively managing and influencing our states. Every time we try hard to make ourselves go to sleep, we use an ineffective method for attempting to manage one level (facilitating sleep) by another level (order, commanding— "trying hard"). This introduces paradox into our mind-body system. After that, the more we do this, the more we worsen the problem. The attempted solution increases the problem. This gives birth to the relational question about how one level of mind interacts with another level. "What happens when I bring one thought or representation, at one level of mind, to bear upon another thought at another level?" All kinds of things! Meta-States specifies at least sixteen different possible results. Out of the interface of one state of mind upon another, numerous systemic complexities can emerge. Sometimes one state interfacing with another amplifies the two. Sometimes it reduces the first state. At other times it can completely nullify it, softens it, create paradox, interruption, amnesia, etc. In reading and experiencing the Thought Experiments and Meta-State Patterns in this work, you will exercise your own ability to "run your own brain." This will provide you practice in directing the operations of your mind. With each move you will be "stepping back" from your thinking-and-feeling to observe the products of your consciousness. Doing this self-reflexive shifting involves what we call "going meta," or taking a meta-position, to your own consciousness. You will be using your reflexive awareness to become aware of your awareness. At first, you may feel dizzy, even disoriented. At first it may feel weird and "not like me." You may even feel tempted to fear this level of awareness, thinking that you’ll get caught up in a loop or that others will think you’ve "lost your mind." Well, you won’t get caught up in a non-existing loop. About the charge of your friends and family thinking that you’ve "lost it," well, they may have a point... for awhile ... until you emerge as a master of your mind. Then you’ll get the last laugh. As you move up (conceptually, of course) in your mind and identify higher level managers, you move to a higher perceptual position. You begin by first simply observing something in the world. Then you observe your own observing, then you observe your observing of the observations. With each move, you attain (conceptually) a higher logical level as each level operates above, and about, the lower level (that’s what the word "meta" means). At each level, you reflect back onto your previous thinking or experiencing. Mind is like a wild and powerful force, like a stream of water in which we navigate in a canoe, raft, or kayak. To do this effectively, we need both skills and an understanding of the structure and nature of the craft. We need to know certain principles of navigation. We need to know how to use a compass, a paddle, and to learn to calibrate to the movements of the river. This also applies when we explore the art of learning to navigate your inner stream of consciousness—which, as you access and develop your executive power will become "a piece of cake!" Because we have a consciousness that operates on many levels, our executive power lies at the higher levels of mind. So that’s where we will go. Our brain’s ability to reflect back on itself enables us to toy with our own brain and to even learn to direct its operations to a great extent. Accessing our executive levels will allow us to take charge of our mental-emotional programming. Then we will not default on the programs of our genetics, culture, family, etc. This will enable us to take a much more intentional stance in life as we choose to "run our own brain" and develop personal mastery. If our current "programs" for thinking, feeling, speaking, and acting do not make life a party, we only have to access our executive states, get to the boss, and from there establish new goals, games, and values. The secrets of accessing our executive power provides us the way to truly take charge of our mind, meta-mind, and everyday actions. So on to the game—turn the page to begin the journey toward your own Personal Mastery. Shipping and Handling in the USA is generally $5 for the first book plus $2 per each additional book. For orders outside the USA, send an E-mail to us with the books you wish to order plus your shipping address and we will notify you promptly of the shipping charges. Air mail charges vary dramatically from country to country. Pay with your own personal PayPal account. You can contact me via phone, fax, email, or snail mail and I can accept your personal Master Card, Visa Card and/or Discover Card directly. ©2000-2006 Bobby G. Bodenhamer and L. Michael Hall. All rights reserved.